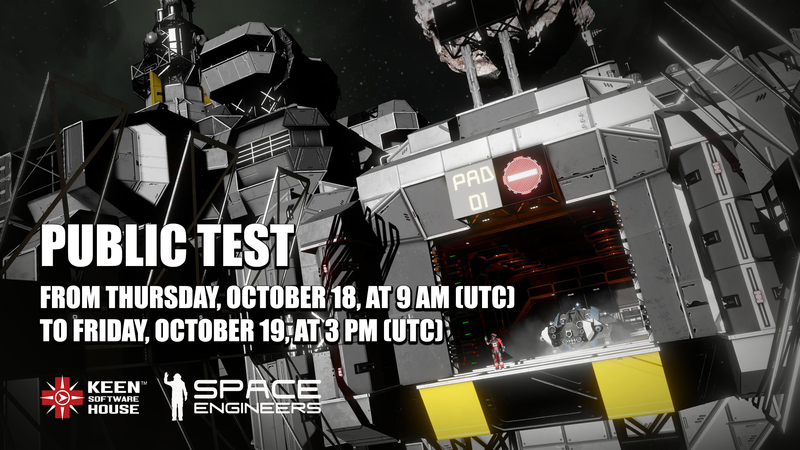 Back by Popular Demand it's Another Public Test! Like our recent Public Tests, there will 3 survival servers for this test, one for each time zone. As always, we will announce the branch code here at the time of the test and we will make a dedicated server available as well. 1. Select the game from your library, right click and select properties. A dialog box with a number of tabs will appear, you’re looking for one that says "BETAS". 2. You will see 2 things now, a drop down menu and a text box to enter a beta access code. Enter the password provided here and choose mptest branch from the drop down menu. What new features and improvements can you expect from this test? Please note: [b]Good.bot[/b] was created by us to help new players learn how to play Space Engineers. Good.bot is still in its infancy and is currently able to assist players when it comes to learning about blocks, tools, resources and movement in the game. However, we are still in the process of fine-tuning Good.bot, so it becomes more efficient in providing assistance for newcomers to Space Engineers. With that in mind, please be patient with Good.bot.😉 We encourage you to ask Good.bot whatever you want, as this will help us to improve its functionality, and make Good.bot even more helpful for new players! As with our previous Public Test, players will be able to submit their feedback on all of these features via a survey at the end of the test. Thanks for reading and we hope to see as many Engineers as possible this Thursday!